Of the fifteen Places in Shadowkey, only two are located in Skyrim (Lakvan's Stronghold and the Crypt of Hearts), but the influence of the province is felt throughout the game. Skyrim is at war with Hammerfell, trying to capture the city of Dragonstar, and her agents and soldiers will be found in many places. 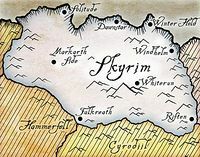 Skyrim Sympathizer's Map: Retrieve a map for a knight who must await her friends. Tanyin Goblin Raid: Eliminate the goblin hero, Tirasch. Tanyin Lakvan Evidence: Find evidence of Imperial influence for Tanyin Lakvan. Tanyin Mages' Guild: Find the list of Mages Guild members for Tanyin Aldwyr. Tanyin Prisoner Free: Free a hero of Skyrim from jail. This page was last modified on 9 November 2018, at 12:38.